material size by grading or check sieving of your powder, granules or liguids. A range of machines in varying capacities with a wide range of options, such as sack tipping, oversize discharge, rare earth magnets, bespoke design. 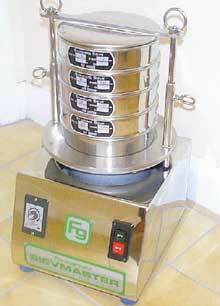 The smallest '300' Laboratory sieve provides an accurate means of obtaining a sample analysis for most powders and granules. The stacking facility provides for close coupling of the test pans without the use on any gasket material and the bottom collecting pan unsures that the entire sample product is contained within the working part of the machine. 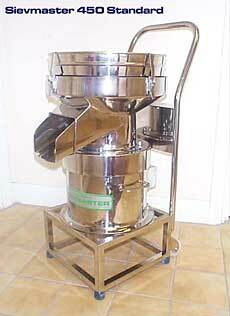 The Sievemaster 450 is the ideal solution for the small/medium bakery. Manufactured with all stainless steel contact parts, the rapid change clean sieve mesh assembly and pans allow for quick product changes. 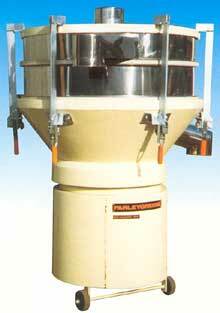 Equally suitable for powders, granules or liquids.